Growth has slowed down due to the end of the commodity boom and weaker doemstic demand, but the business environment remains one of the best in the region. President Michelle Bachelet´s administration is backed by a comfortable majority of the centre-left Nueva Mayoría coalition in both houses of Congress. The reputation of both the government and the opposition has been damaged after several corruption scandals. The outcome of the October 2016 municipal elections suggests that the chances of the centre-right Vamos coaltion winning the November 2017 general and presidential elections have substantially increased. However, such a scenario is not expected to lead to a significant policy shift. 45% of export earnings, 25% of direct and indirect government revenues and 10% of GDP) and subsequent demand from China, which accounts for more than 25% of exports. A large stock of inward portfolio investments exceeding 200% of official reserves makes the country vulnerable to shifting market sentiment. 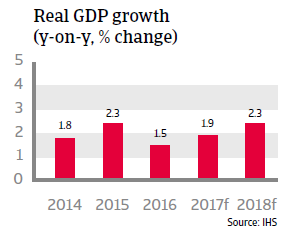 In 2016 economic growth remained modest due to persistently low copper prices, the economic slowdown in China and weaker domestic demand. 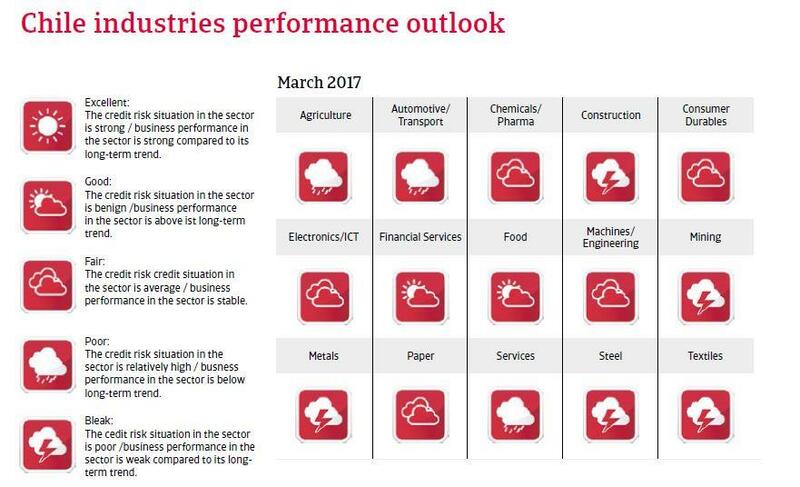 In 2017 only a modest GDP increase is expected as commodity demand is forecast to only pick up slightly, with the metals and mining sector´s performance remaining subdued. 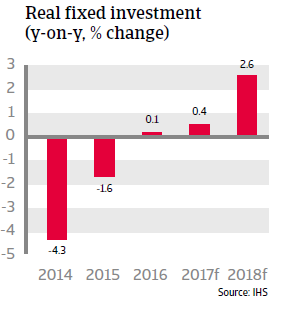 At the same time, domestic demand growth is hampered by increased household debt (household debt service rose to more than 30% of household income). However, decreasing inflation allowed the central bank to lower interest rates in January 2017 in order to boost growth, and additional rate cuts are expected in the course of the year. It remains to be seen what will be the impact of the new US administration´s economic policy on Chile. On the one hand, Chile´s commodity industry could benefit from large-scale infrastructure projects in the US. 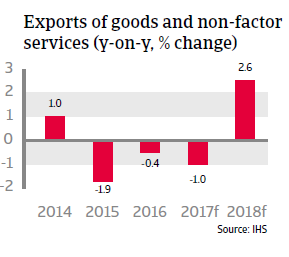 On the other hand, Chile´s very open economy could be adversely affected by US protectionist trade policies directly (in its trade with the US) and indirectly (via a potential slowdown in trading with Asian countries as well as with Brazil and Mexico). Any disturbance of global trade flows by new protectionist measures would definitely impact Chilean exporters, despite the fact that the country has bilateral and multilateral free trade agreements with more than 60 countries. That said, the economy´s shock resistance remains strong, given prudent macroeconomic and financial policies, modest fiscal deficits, low public debt (mostly peso-denominated and domestically held), a sustainable external debt rate of 62% of GDP in 2017, and sufficient liquidity (more than six months of import cover, additionally underpinned by a Sovereign Wealth Fund that currently amounts to USD 24 billion, or 10% of GDP). A flexible exchange rate has also served as an effective shock absorber, mitigating the impact of low copper prices and subdued external demand on Chile´s current account. The currency was volatile in the wake of the US presidential election, but on balance it remained stable ever since. In 2017 gradual depreciation is expected. The Chilean business environment remains one of the best in the region and the government continues to stimulate foreign investment. Chile´s banking sector is healthy, well-regulated and sufficiently capitalised, with low non-performing loans (about 2% on average). Good access to foreign and domestic capital by local companies reduces refinancing risks.